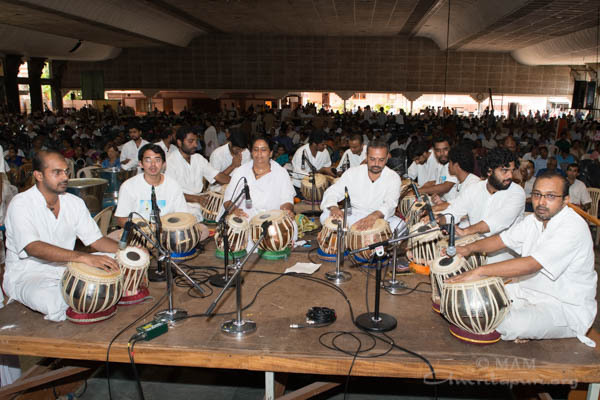 Thousands gathered at Amritapuri today to celebrate Vijaya Dasami in Amma’s presence. 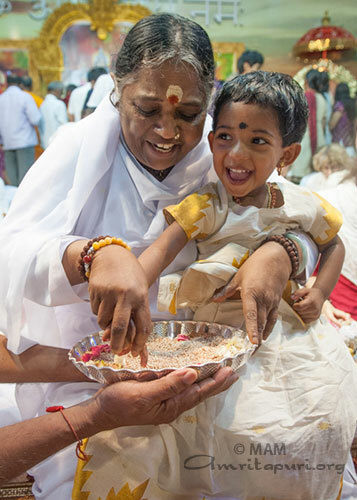 Amma led the assembled crowd in a prayer for world peace, and then led everyone in the traditional writing and reciting aloud of each letter of the mantra, “Om Hari Sri Ganapataye Namah.” Afterward, she personally held the index finger of hundred of babies and initiated them into the alphabet, helping them to write the sacred mantra in a plate of rice as per the tradition. “This mantra [ Om Hari Sri Ganapataye Namah] symbolizes all 51 devanagari letters that are the embodiment of the nada-rupini devi—the Goddess of Sound. In the mantra, Hari represents the Paramatma. Shri represents Parasakti. And Ganapati represents Om—the pranava mantra that arises from Parasakti. In essence, the mantra is a complete form of worship. Traditionally some people write Hari Shri on the tongues of infants with gold tipped with honey. 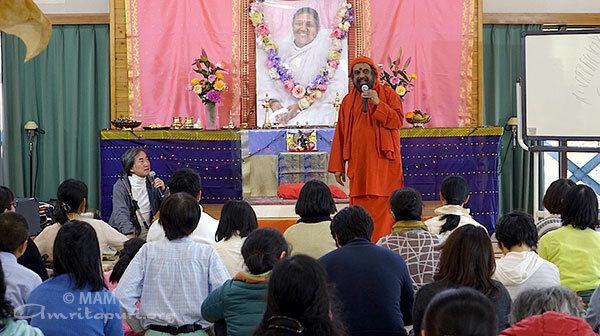 The principle being “May what this child speaks become as valuable as gold.” Although knowledge in itself is invaluable, the tradition persists” Amma said. 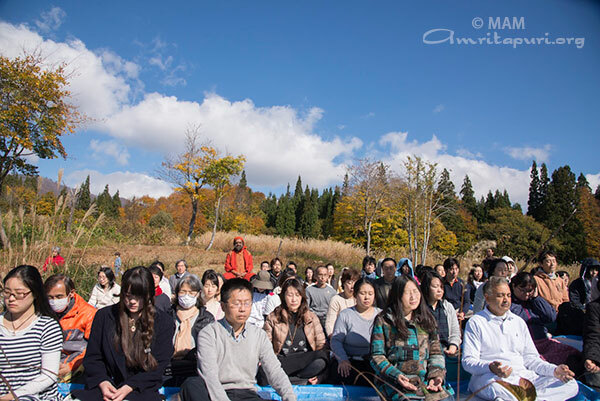 Amma continued: “We should always remain a beginner, with alertness, patience and enthusiasm. It is the principle of having respect for everything, bowing down in humility to all, ever being a beginner. Life is a book from which we can constantly learn. It is like sitting in an examination hall. At any moment the bell may ring and you will have to turn in your test. So, it is what you are doing in this moment—now—that determines your success or failure. So, we should have the alertness in each and every action that we would have if we were standing before a blazing fire. If we can maintain that level of alertness, then we can learn a lesson from each and every thing. “In the olden days, the disciple would sit facing the guru and the knowledge would be assimilated directly from the guru into the disciple’s heart. The disciple would verily install the guru’s teaching in his heart. The disciple’s attention and humility brought about the knowledge’s full bloom. The disciple never tired of learning. Nor did it ever feel like a burden to him. “The disciple’s heart is the bud that blossoms in the sunlight of the guru’s love. 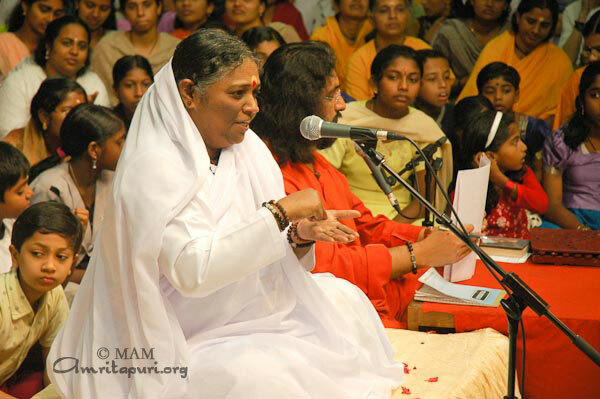 It is filled with the nectar of the guru’s grace” Amma reminded all. “For Vidyarambham, we mix raw rice with a pinch of turmeric on a tray and keep sandal paste and flowers. Then the teacher, holding the child’s hand, guides him in writing his first letters. 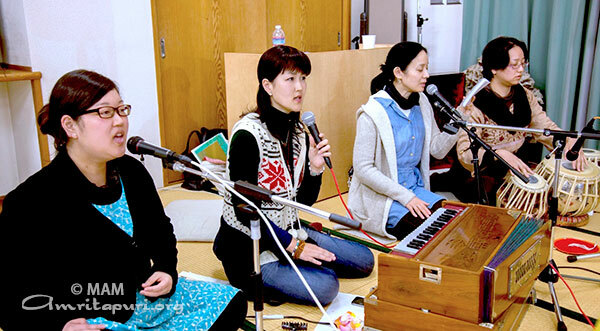 The teacher represents the supreme principle of God. It is only when knowledge flows through the teacher that it bears fruit. 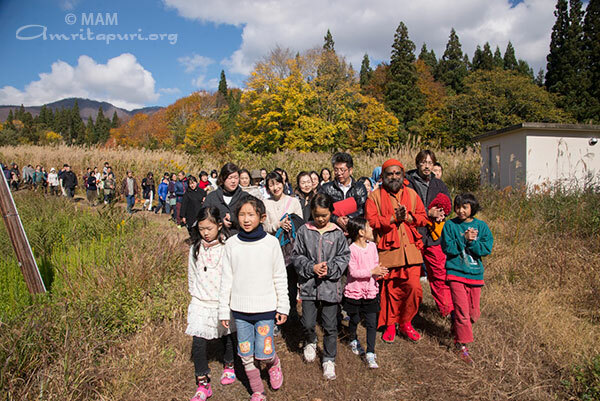 Inherent in this practice is the principle of saranagati—surrender. When we point out the faults of others, we use the index finger. But we forget that in doing so three other fingers are pointing back at us. So, when we point out the faults of others, it is as if we are three times worse. Thus, the index finger represents the ego. It is this index finger that we give to the teacher and, holding which, he helps the child write his first letters, initiating him into knowledge. It’s the resolve, “I am nothing. You are everything.” If you become a zero, you can become a hero—that principle is there. 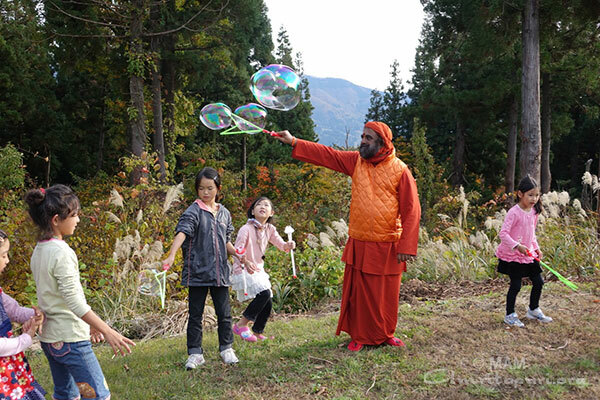 “When we see the underlying oneness in everything, compassion will arise in our hearts. When this feeling of oneness expresses itself, then we will have the conviction that no one should experience sorrow, no one should starve. 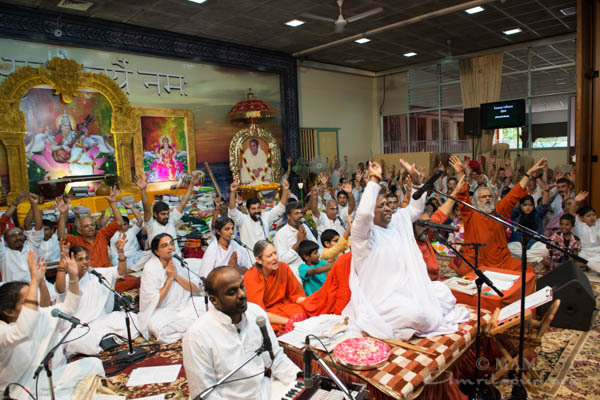 That awareness of oneness is the Divine Mother” said Amma in her Vijaya Dasami message. Navaratri – the nine days of festival of Devi concluded today with Vidyarambham this morning of Vijayadasami. 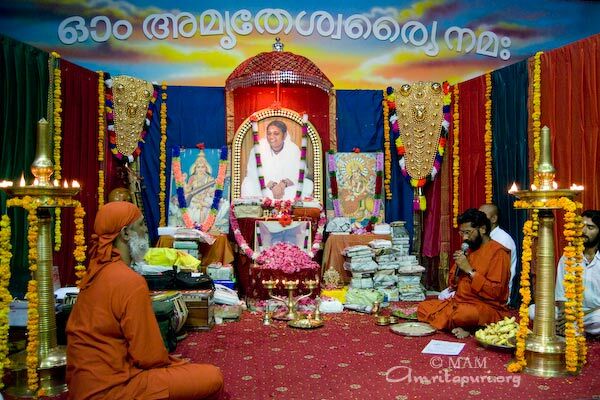 Swami Turiyamritananda and Swami Amrita Geetananda led the prayers during Vidyarambham. There were hundreds of people who came to initiate their children on to the world of alphabets. 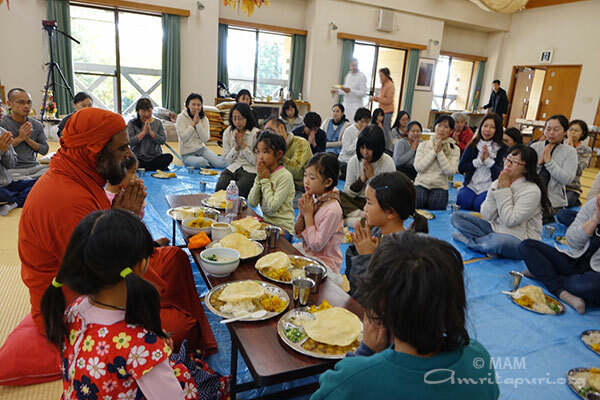 Swami Turiyamritananda initiated them, first writing on rice in a plate and then on their tongue. Friday marked the beginning of the last three days of Navaratri during which Saraswati, the Embodiment of Knowledge, is worshipped. 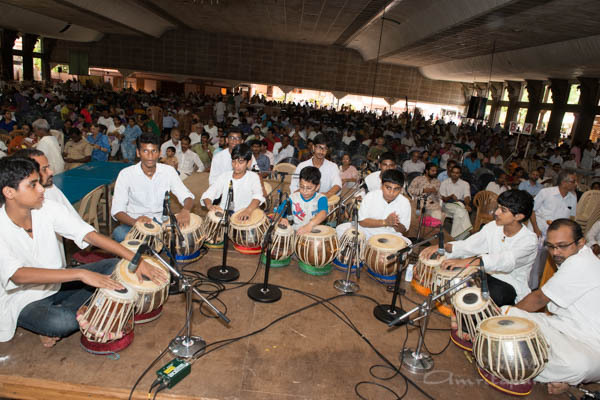 Village children began arriving at the Ashram in the late afternoon to place their school textbooks and musical instruments on the temporary altar that had been set up on the stage in the main hall. Each item was given a number and labeled with the child’s name, age, and village. 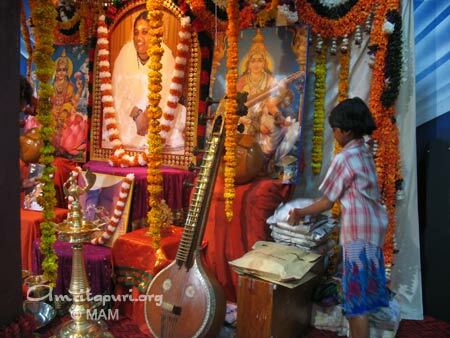 They were later joined Brahmacharis, Ashramites and University students who were also adding their own items to be blessed by the Goddess Saraswati over the net three days. 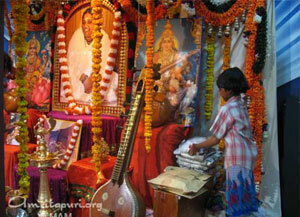 Sw. Turyiamritananda performed a brief puja after which everyone approached the altar and offered flower petals. The day after Navaratri (Sunday morning) is Vijaya Dashami (tenth day, festival victory) and it is on this day that everyone picks up their items and either undertakes new tasks or resumes existing ones with a child like innocence. Sw. Turyiamrita will perform a special ceremony in which pre-school children are introduced to the first letters of the alphabet. 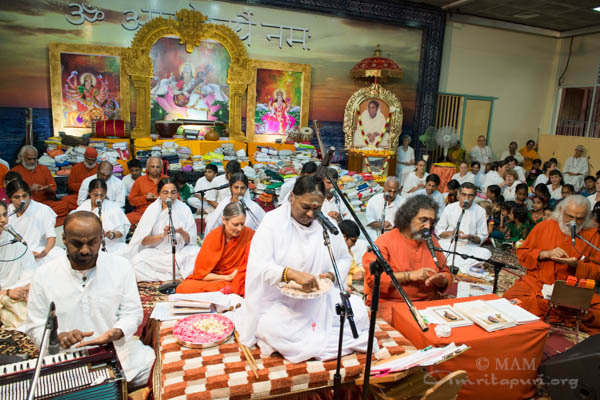 Amma initiates babies into the world of alphabets, first lessons of tabla, harmonium and veena during Vijaya Dashami celebrations. 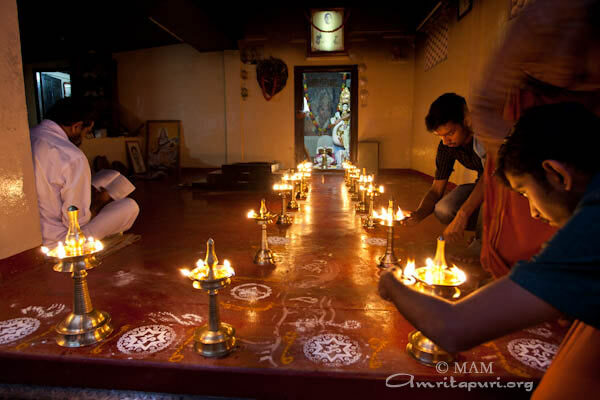 At Amritapuri, the ceremony involves tracing each letter of the alphabet in a plate of rice or even in sand on the ground. Traditionally, the writing was alternately done on the tongue with a gold dipped in honey. Navaratri is a festival that is celebrated all over India. The word nava-ratri itself means “nine nights.” We are presently living in the night-i.e. in darkness, in the darkness of ignorance. 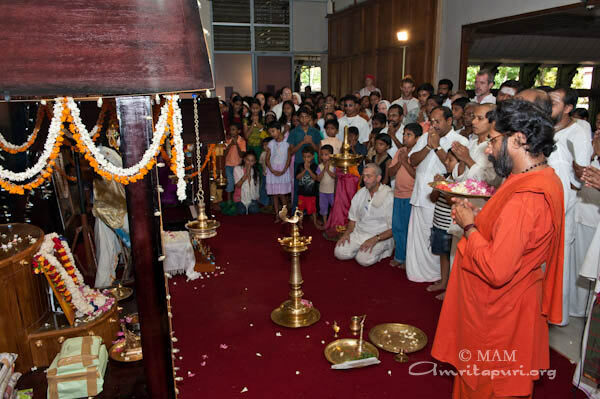 The Navaratri Puja signifies the removal of this internal darkness and the dawning of the light of knowledge. In this way, when the nine nights are finished, the 10th Day comes: “Vijayadashami.” Here, vijaya does not mean “victory” in the ordinary sense. Here, it means breaking the shackles and the limitations of the mind and attaining complete and total freedom. The word navam also means “new.” When all the papas [negative tendencies] of the mind are washed away, we get a new birth;we are born again. We then understand that this body is the abode of the Parashakti [the Supreme Power], we experience the wonder and freshness of the Atma [Self] everywhere. For the first three days of the puja, we worship Durga, whose mount is the lion. Durga is the embodiment of shakti [power]. She is the fierce aspect of God. 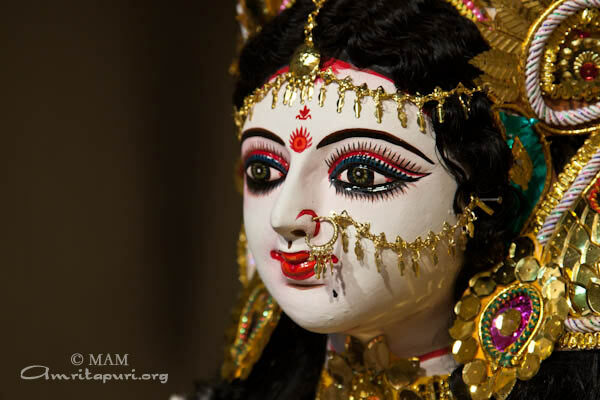 We worship Durga with the intention of removing attachment and aversion as well as anger and desire from within us. Only if we have shakti will our resolve be firm. Only then will we be able to destroy our internal enemies. Durga is the shakti that arises when the mind becomes still. The sword in the hand of Durga is the symbol of vairagya [dispassion]. It is the sword of knowledge. The intense desire to know God is viaragya. It is only with this sword that we can destroy the demonic qualities of the mind. This is the principle behind Devi killing Mahisha Asura [the Buffalo Demon]. Actually, through the worship of Durga, we are awakening the indwelling shakti. Only by awakening that shakti can we wage war against the weaknesses of the mind and come out victorious. After removing the negativities of the mind through the shakti of the Atma, the next step is to inculcate good qualities within. That is why we worship Lakshmi Devi, the embodiment of auspiciousness for the next three days. Through worshiping Lakshmi Devi, we should develop divine qualities such as love, compassion, kindness, charity, forgiveness and patience, etc. When the negativities have been removed and the divine qualities have been inculcated, then knowledge dawns. 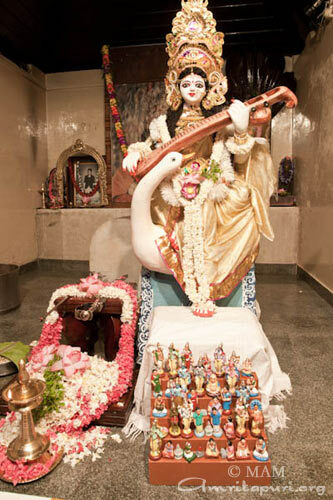 That is why we worship Saraswati Devi, the embodiment of knowledge for the final three days of the puja. The 10th day is Vijayadashami. It is also known as dashara. The meaning of this word is dasha-papa-hara: destruction of the 10 papas [negative mental tendencies]. It is through the five organs of action and the five organs of knowledge that the mind experiences the worldly pleasures. That is why we are unable to realize the indwelling Lord. It is these 10 continuously extrovert organs that are meant by the “10 papas.” Vijayadashami is the day when one overcomes these 10 papas and achieves the victory of Self-knowledge. In the Hindu scriptures, tremendous importance is place on the number three and its multiples;especially the number 18. Another name for the Epic the Mahabharata is “Jaya.” The Bhagavad-Gita [which is in the Mahabharata] has 18 chapters. There were 18 akshauhinis [battalions] that participated in Mahabharata war. That war on the Kurukshetra battlefield lasted for 18 days. It is through 18 indicators that the Lord describes one who is established in the Self [in the Gita]. And our Puranas [epics] and Upa-puranas [sub-epics] are each 18 in number. And in Nava-ratri, the number nine is there. Nine is half of 18. To put it succinctly, the essential principle of Navaratri is to defeat the non-Atma and achieve the victory of the Atma. During Navaratri’s final three days, the workers and business owners, the pundits and the uneducated, the poor and the rich, the Brahmins and the non-Brahmins, the students the teachers all keep their tools and books for the puja. 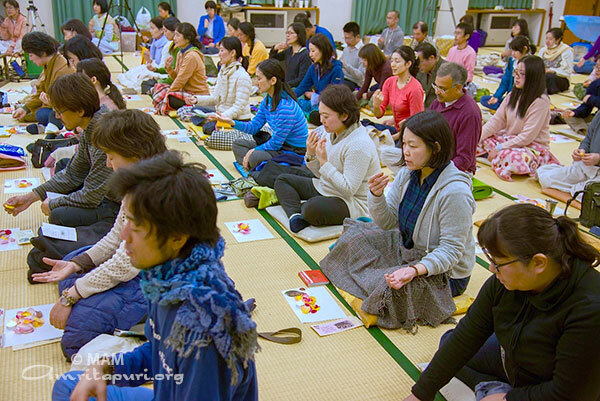 Throughout these days, they do japa and meditation. All that is sentient and insentient is worshiped on these days. Everyone offers obeisance to the Indestructible that is the foundation of knowledge and the indestructible Parashakti. 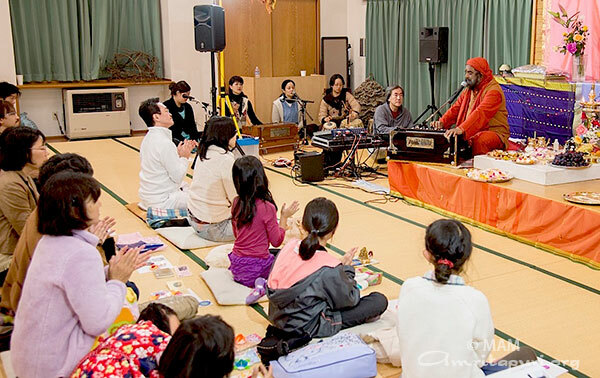 By writing “Hari Sri” as the first syllables, everyone from children to the elderly become tiny children in front of that Eternal Knowledge;they become beginners. If we keep this truth in mind, this life will be blessed. Then the Goddess who’s own nature is Shakti will bless us with victory. “My vidyaarambham (news) took place 48 years ago. I was four then. 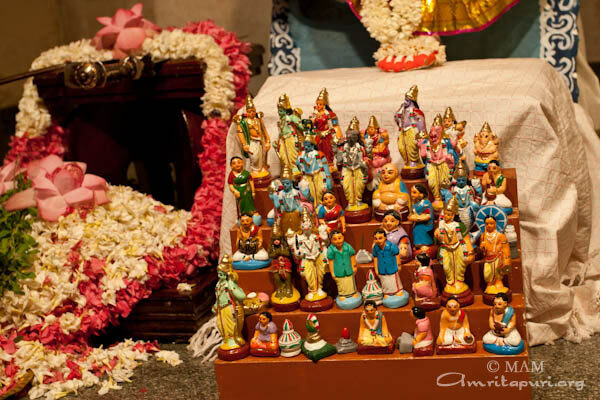 Every navaratri, we used to place the items for worship in the Kunnumpura Veedu, a house near ours. 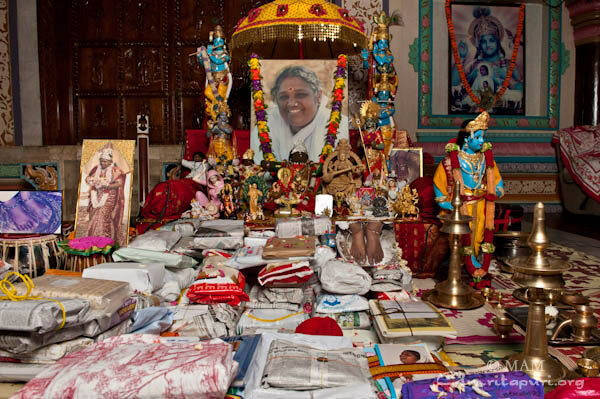 It was my mother, Damayanti Amma, who took me to there for the vidyaarambham ceremony. “The person who initiated me into learning was an 85-year-old aashan [teacher]. He took my index finger and made me write ‘Hari Sri‘** on the cow-dung-paved floor on which sand had been spread out. Later, I was sent to the aashaan pallikkootam*. Q: Which is Amma’s most memorable experience? 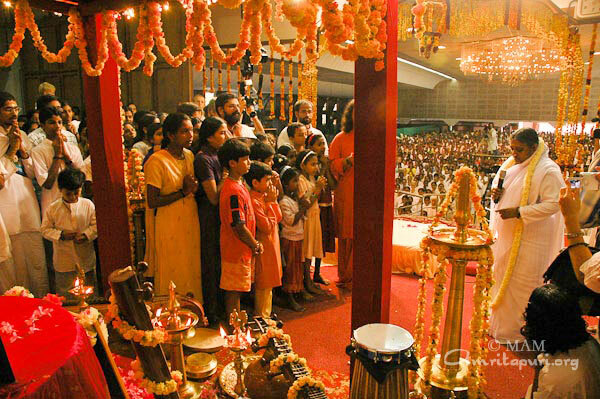 “Since the ashram started, we have been observing Vijayadashami and Vidyaarambham here. There were years when up to 500 children were initiated into learning here. 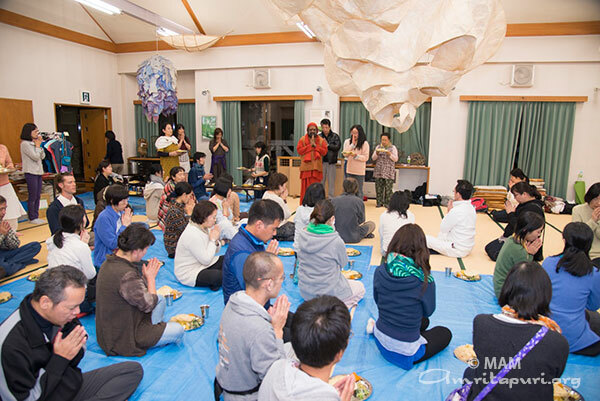 But for the last many years, I have been overseas during Navaraatri. This year too, I won’t be here. 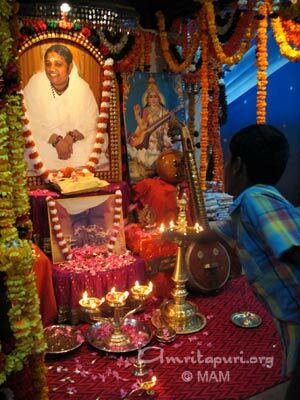 “Even though Amma may have initiated many children into learning, an unforgettable case was that of a girl named Lakshmi. Lakshmi’s only near and dear ones were her mother and younger brother; her father had abandoned them somewhere in Tamil Nadu. Once, when these young children were starving, they went to a restaurant and begged for some food, the proprietor of the hotel threw some hot water on them. The mother, who was proud, took the children to the beach. She flung her young son into the sea. Then, grabbing her daughter, she went near a railway track. When the train approached, the mother jumped before the train. Someone took the orphaned Lakshmi to the Parippally ashram. *An aashaan pallikkotam was an informal learning centre where children were taught to write and pronounce the 52 Malayalam alphabets correctly. Such centres had no blackboards; children had no slate or notebook either. So, they would write the alphabets on the ground and say them aloud as they wrote. The job of the aashaan [master] was to ensure that the children wrote and pronounced the alphabets correctly. Later, the children would enrol in regular schools. **Initiation into the world of alphabets usually begins with the writing of the mantra ‘Om hari sri ganapataye namah.’ ‘Hari’ refers to the Lord, ‘sri,’ to prosperity. 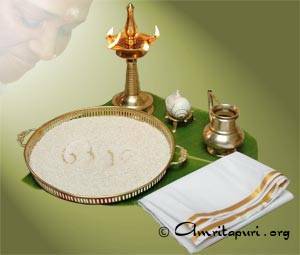 At first, the mantra would be written on sand or in a tray of rice grains. Then, the master would write the mantra on the child’s tongue with gold. Writing on sand denotes practice. Writing on grains denotes the acquisition of knowledge, which leads to prosperity. Writing on the tongue with gold invokes the grace of the Goddess of Learning, by which one attains the wealth of true knowledge. Navaratri highlights the principles elucidated by the Ramayana. This is hinted at in the other name by which Vijaya Dashami is known in India, Dussehra. “Dussehra” is derived from “Dasha-hara”, which means “victory over the ten-faced one”. This ten-faced being (Dashamukha) is none other than Ravana, Lord Rama’s adversary. His ten heads symbolise the ten senses (five of perception and five of action). 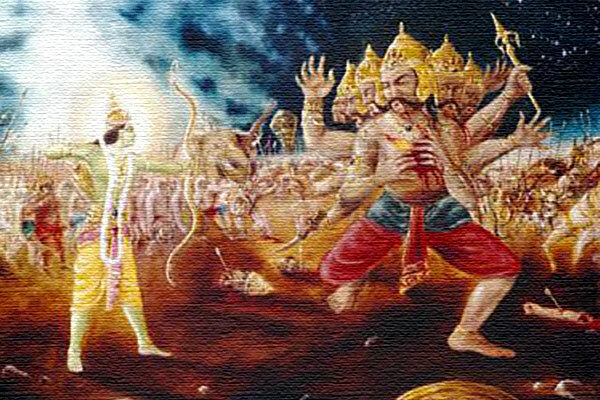 Ravana’s manifest extrovertedness stands in contrast to Dasharatha, Lord Rama’s father, whose name can be taken to mean “one who has controlled his ten senses.” That he is father to a Divine Incarnation suggests that only when one is able to subdue all ten senses can one realise the divinity within. In similar allegorical fashion, Sita, Rama’s consort, represents the mind. As long as the mind remains wedded to the Self within, so long will bliss ensue. That is why Rama and Sita are depicted as enjoying a harmonious and satisfying relationship, both amidst palatial comforts and the privations of the forest. As soon as the mind withdraws from the Self and turns outwards to worldly objects, bliss ceases, and sorrow follows. In the Ramayana, Sita becomes distracted by a golden deer, actually an asura (demon) in disguise, and starts coveting it. Rama counsels her on its true nature, but Sita remains deaf to his words of wisdom, and insists that he captures it for her. Rama orders Lakshmana to remain with Sita and protect her from danger, while He pursues the deer. As soon as Rama hunts it down, the magical deer treacherously calls out, in Rama’s voice, to Lakshmana and Sita for help. Hearing this, Sita is convinced that Rama’s life is in danger and tells Lakshmana to hurry to Rama’s rescue. Lakshmana, who represents tapas (austerity), recognises that the situation is a trap and tries to advise Sita accordingly. Sita arrogantly rebuffs his explanations and orders him to leave at once. Seeing no other way out, Lakshmana leaves in search of his brother. Before leaving, he draws a line on the ground and warns Sita not to cross the line. This line, the Lakshman rekha, marks the limits of morally permissible behaviour. Because Sita trespasses into forbidden territory, she has to suffer the consequences: she is taken captive by Ravana. Only after this ten-headed egoist gets destroyed, only after the ten senses are controlled, is Sita reunited with Rama. The story of the Ramayana is relevant to us as well. 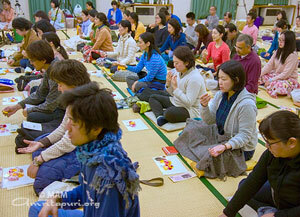 If we wish to progress spiritually, we have to first make efforts to control the negative tendencies. Only then can we cultivate the positive ones. In the Bhagavad Gita, Lord Krishna enumerates the signs of a Jnani (one who has realised the Self), not because an ordinary person can recognise such signs, but so that we may cultivate those qualities. Likewise, Amma says that we should read stories about Lord Rama so that we may become Rama Himself, that is, imbibe His noble qualities.